Your child learns nearly everything from you. They see you day in and day out, and pick up on the things that you do, or that you don't do. If you want to guide your child to taking care of his or her mouth regularly and keeping their mouth healthy, you need to show them this type of behavior through your actions. Each day, make a point to take care of your mouth in front of them. If you can, do your oral hygiene routine at the same time they do theirs. It will teach them that you value your oral health, and pass that same care on to them. 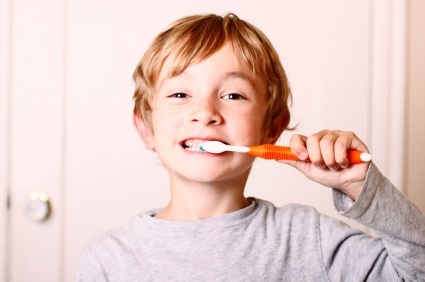 The best way to guide your child is to follow a regular oral hygiene routine. Each morning and each night, brush your teeth really well for two full minutes. After at least one of those brushings, make sure to floss your teeth. Show them how to do it right by doing it right yourself. Rinse your mouth out each day with a really good mouthwash to ensure that you are getting all of the bacteria and microbes out of your mouth. Do this at the same time as them, because then, they see that it is something everyone does. It is important that you show your child that you are doing it, too, not just expecting something out of them that you are not doing yourself. If you want more tips on helping to improve the oral health habits of your child, contact our office. We can tell you if anything is amiss in your child's mouth, and if so, what can be done to correct that issue before it becomes a problem.